Small-to-Medium Size Classrooms and Conference Rooms, including those that need extended video sessions, and particularly those that need the flexibility for placement provided by the 1.6x zoom lens. Can be ceiling mounted, cart mounted, or used in portable applications. Physical attributes. The connection panel is on the rear of the unit. Looking at the projector from behind, the AC power input is on the left, centered between the top and bottom; the Kensington Lock Slot is on the left side panel, about a third of the way towards the front; and the security bar is on the bottom edge of the right side panel. The control panel is on the left side of the top surface, near the back. Cooling intake vents are on the left side of the projector with the hot air exhaust vents on the right side of the front. Presentation Optimized Lumens. All modes deliver vibrant, saturated color, making Dynamic mode more than acceptable when you need the maximum brightness for a very large screen or a high level of ambient light. If you don't need the full brightness, however, Presentation mode's default settings will generally give you the best color quality for presentation material, with a solid 2900 lumens. Video Optimized Lumens. Theatre mode delivers the best video quality of the predefined settings. However, the color can be improved a bit by adjusting color temperature and individual color settings. That lowers the brightness, but still delivers more than 1550 lumens. Zoom Lens Effect on Brightness. At its maximum telephoto setting (minimum zoom) the 965H's brightness drops by only about 12%, to 3191 lumens with the Dynamic preset and Normal lamp mode. That's barely enough to notice and far less than typical for a 1.6x zoom. Low Lamp Mode. The Eco lamp mode reduces lumen output by 34%, which is still easily bright enough for many classrooms and conference rooms, particularly with Dynamic mode. That makes it practical to take advantage of Eco mode both for the lower power use and for doubling lamp life from 5,000 hours to 10,000. Brightness Uniformity. We measured uniformity for the 965H test unit at 81%, a difference that's impossible to see with any image that breaks up the field of view. Input Lag. With the default settings, the Bodnar meter measures the input lag at roughly 44.5 ms in all preset modes. On-board Audio. The audio system is well above par for this size projector. The 16-watt speaker delivers easily enough volume to fill a mid-size conference room or classroom, and the sound quality is far better than most models offer. This will be particularly welcome if you want to bring the 965H home to watch sports or a movie. Fan noise. Epson rates the 965H's fan noise at 37 dB in Normal mode, but it hits that peak only when you first turn it on, when it's cooling down after you turn it off, and presumably if it gets too hot. It was much quieter in our tests in normal use. I didn't find it bothersome sitting even 7' away. However those who are particularly annoyed by fan noise might, since you can hear its low pitched hum from 15' if you listen for it. In Eco mode, the rating is a much quieter 29 dB, which is still audible from 10', but I didn't find bothersome from 4'. High Altitude mode is recommended for elevations above 4921 feet (1500 meters). In this mode, the noise in Normal mode is both at a higher level and a higher pitch, which makes harder to ignore. If you need to use High Altitude mode, you'll probably want to stay with Eco mode. Throw distance. The 965H's 1.6x zoom gives you significant throw distance flexibility for a given size image. Even better, the low loss of brightness at the extreme telephoto setting--only about 12%--means you're free to use the long throw end of the zoom without worrying about impact on brightness. For the native 4:3 aspect ratio, the throw distance for a 120" diagonal image is roughly 11' to 18'. To find the right range for the image size you want, see the Projection Calculator. Vertical Offset. With the projector on a table in front of the screen, it throws a 4:3 image that places the bottom edge of the image at 11% of the image height below the centerline of the lens by our measurements. The offset is designed to work best with the projector on a shelf or wall mount behind the audience, or on a table or cart. The offset will also work with the unit inverted in a ceiling mount, but you may need to extend the mount lower than for projectors that offset the image up instead of down when not inverted. Alternatively, you can tilt the projector down to compensate for the offset, and then adjust for keystone distortion with the automatic or manual keystone adjustment feature. At its $899 retail price, with lower street and education pricing available, the Epson 965H is an attractive choice for classrooms and conference rooms that need high-quality images, including highly watchable video--particularly for those that also need the flexibility in placement that comes with a 1.6x zoom. With its brightest color mode and Normal lamp mode, it's bright enough, at more than 3,600 lumens, to easily throw a 165-inch diagonal image that can stand up to moderate ambient light with its wide angle setting. Even at its full telephoto setting it puts out nearly 3,200 lumens. And in Eco mode, which reduces fan noise significantly and doubles lamp life, it's bright enough for a 130-inch image. Even the video-optimized calibration delivers more than 1,550 lumens, making it bright enough for a 105" image in a family room with the lights on. The 6.4 lb. weight makes the 965H an attractive choice for road warriors. Having a large zoom with little loss of brightness makes it easy to get an appropriately sized, bright image no matter where you have to position the projector in whatever room you're in. The light weight combined with excellent video quality for the resolution also makes it a good fit as a business projector you can bring home on weekends to watch movies and sports. Its audio system is a welcome extra, with both lack of distortion and high enough volume for a midsize classroom, conference room, or family room. And although its 45.5 ms lag time is a little slow for serious gaming, it's suitable for most casual gamers. 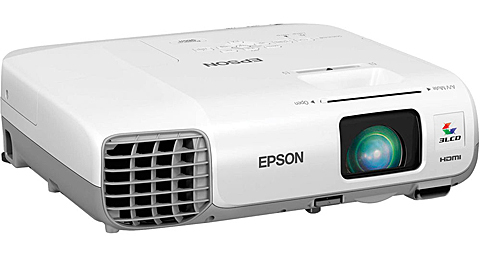 For anyone who needs a bright, 1024x768 projector with a high quality data and video plus a zoom level that allows significant flexibility in placement, the Epson 965H is an excellent fit. If you also need portability--to bring it with you on the road or bring it home for personal use--it's an even better fit.